So last night I went to the opening of Art and Soul in Portland which they had a lecture from Danny Gregory. He has written several books such as "Everyday Matters" and "Creative License" which his books illustrate (no pun intended) how he rediscovered drawing in his mid thirties and how it has led to his several books. The main thing that really resonated with me was that you need to be fearless with drawing and how drawing specifically changed his life. I never really thought about how Art changed my life. Art has been in my life since before I could remember and it's always been there. Art has changed my life completely because with out it I would be a totally different person. I do carry a sketch book and I do sketch often. So I decided to share something from my sketch book. My little puppy, Winston snoozing away on his favorite pillow on the couch. I think he is probably one of my more favorite models. So I learned a valuable lesson over the weekend. I had the closing reception at Moxie this weekend and I received a phone call this past week that I had a customer interested in one of the larger pieces but there was a "finger print" and I would need to fix it in order for the customer to buy it. Well since I am a extreme perfectionist- I started having flashes of someone wiping their grubby muddy hands all over my painting... maybe spitting on it.. poking at it.. So who knows what could have happened to my poor innocent painting and the damage kept getting worse in my mind. I let Moxie know that I would bring a small repair kit and see if I was able to fix it. So I get to show and I take a look at the painting and I do not see a finger print at all. On all my paintings I put on the varnish and it usually is not even and I only do one coat and it's meant to be uneven because I like the how the light hits the painting. Thankfully I had nothing to repair and it was a part of the painting. The worst part about the whole situation is that I am a little sad to see this painting go :( it's one of my favorites. I usually like to meet the people that buy my work so that I can make sure my paintings go to a good home. I have a closing Reception for my solo show at Moxie this Friday from 6-8 pm. I can't believe we are fast approaching the end of September. Pretty soon it will be Halloween! I have 6 paintings hung at this fantastic South East Portland boutique. I have been showing my work for about 4 years now and I remember that when I first started trying to show my work I sent an email to Moxie. I never heard anything until recently but it's funny how you can put things out into the universe and it happens. My good friend Lisa Madrid will also be bringing her cupcakes fresh from her bakery for the closing reception. They are scrumptius little bitefuls of yumminess. She bakes everything from scratch and they are little little fluffy pieces of heaven. I do not have the baking gift :( . I am actually a pretty big disaster in the kitchen. I always get messed up with the measuring cups and everything turns out dense. 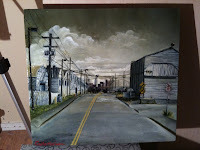 Here is one of my paintings that i have been working on of the industrial district in Portland. Well I am no longer in my 20's. I can't believe how time has been going by faster and faster. I know time only gets faster as you get older. I recently went to New York City for my birthday and it was completely incredible and even a little life changing. I went to the MOMA, which was as amazing as I thought it would be. They had a everything from Van Gogh to Jackson Pollock to Freida. I would have to say my favorite by far was Jackson Pollock. 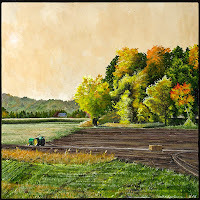 His paintings in person- all I can simply say is that, I totally get it. I have seen a few of the Pollock movies about his auto biography and I always referred to him as the splatter guy. The emotion that jumps off the canvas can only be described in person and knowing the stories behind the paintings just added to the experience. I am still amazed at how fantastic they were in person. It's just a great reminder that sometimes paintings do not translate over print, the web etc. I haven't been to New York in over 10 years but this is was the first opportunity that I had to explore.